I was intending to go to a conference at ExCeL in London Docklands, leaving via London City airport. It seems a very walkable distance between the two, but from Google Maps I can't see if it is practical. Many airports disallow or strongly discourage walking. Will I have to get a taxi, or fiddle around with two DLRs (Docklands Light Rail) (if it's running)? And if I can walk, what route should I take? The two DLRs are typically very quick and easy - I have walked it, but in the winter, or at night you wouldn't want to. 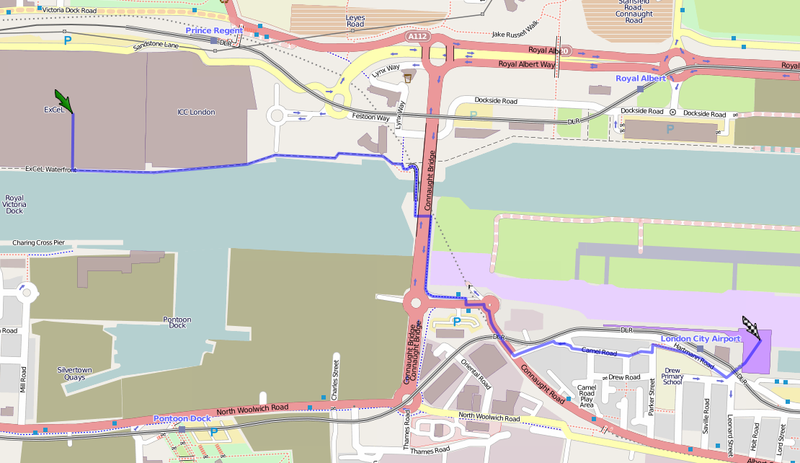 The postcode for the ExCeL center is, funnily enough, E16 1XL (perhaps where it gets its name). Plugging that into the Journey Planner, gives you a 32 min walk. Google Maps suggests a slightly different route, taking 47 minutes. 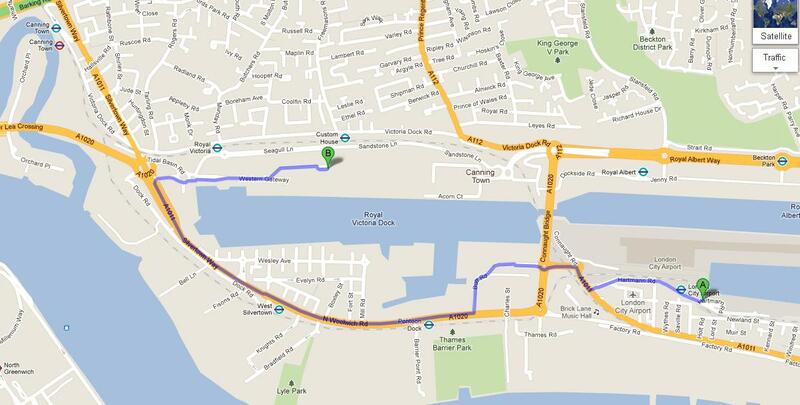 So yes, it's walkable :) I'd take the longer Google Maps one, personally, as you get to see more of the Docklands. I also was intending to go to the dev days, and bought the plane ticket and two nights at Premier Inn as a consequence. Fortunately, CodeKen2011 filled that hole, and I wondered the same as you - looking at the map it wasn't completely clear whether I could walk it, and Google maps disclaimer didn't reassure me. As Gagravarr points out in a comment on Joel's answer, there is a foot bridge which goes underneath the road bridge. It is actually quite pretty down there. I do remember walking from a nearby overland train station to City Airport several years ago. But East London is rapidly changing these days, so I can not say whether it is still possible today. Not the answer you're looking for? Browse other questions tagged airports london walking lcy or ask your own question. Quickest way from London Paddington station to London City Airport? Any (dis)advantages to homestay in Ealing as opposed to a Zone 2 area in London? Are there drinking water fountains airside at London City Airport? Can one walk to the Patriarchate of Peć?